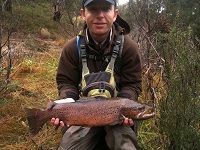 The fishing has generally been good with some nice catches on Powerbait continuing in Eucumbene and some good river fishing with fly. make the fishing difficult at time. 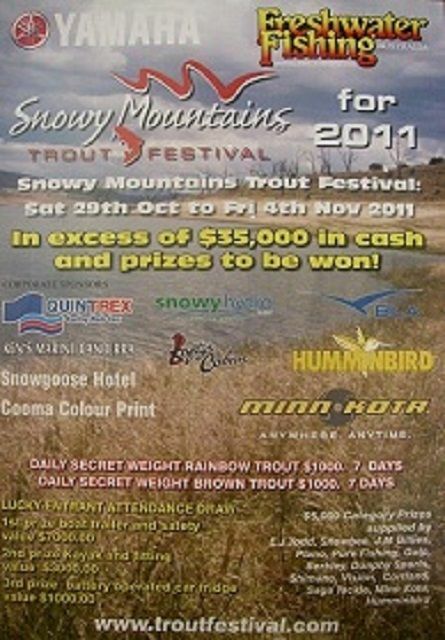 the Eucumbene and Thredbo Rivers so it's time to up your tippet or lose the big one. area are still well worth fishing and are ideal if you want to avoid crowds. Just a quick report on how we went last week. We stayed 6 days at Anglers reach for some great results. In fact best ever and we have been coming up for 8 years.... Three of us caught over 120 fish (all released) with most of them caught up the river at Eucembene Down stream from the portal. Most fish in the river were caught on rapalas cd 5 Brook and rainbow trout patterns..
All fish were in great condition and Pete caught his PB of 68cm around 9-10lb. 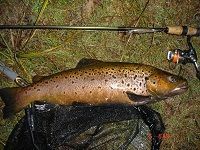 We also caught 2 large browns at 57cm one in the mouth of the river and one on the troll up anglers reach, rapalas and tassie devils 51xmas tree and y94 catching the quality trout. Great time was had by all and special thanks to the Snowgoose Hotel and the Jolly trolley. Here are some pics ...Oh! also not sure how that trout lived with no upper jaw but he was still in good condition..
Hey guys just another report from the local rivers i came back up from Victoria for another weeks fishing and we have been out every day and have caught a few really nice fish the largest of them being a 9 pound male brown and a few smaller at 4 and 5 pound also a really nice brook trout that went 4 pound and a couple of 3 and 4 pound rainbows that were in spawning colours all of the fish were caught spin drifting glo bugs and nymphs and were released after some photos. Just a short note to say thank you to the guys in the Alpine Angler for organising the trout I caught to be preserved by Skins Alive. 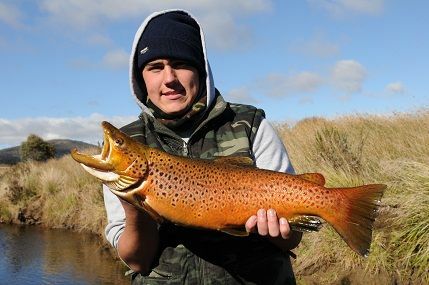 Two weeks ago I fished the Thredbo River top reaches to catch my biggest trout ever  a 8.5 lb Brown on Glo bugs. I had a great time landing it in really cold and windy conditions. Overall in the weekend in our group of 4 we caught around 30 fish and had a great time. My mate Chris Rospara caught a couple of small fish and would have caught more but he worried more about his fiancé Becky than he did about fishing. Thanks for your help again and your welcome to report this. Fly reports have been good for those giving it ago this week. Daytime fishing has genereally been the best with the evenings and night time fishing generally Quiet. Once again the Buckenderra arm has produced some good rainbows and good numbers both off the bank. Any small wet or bead head nymph and wooly buggers will be eaten by the hungry rainbows that are in residence in that area. 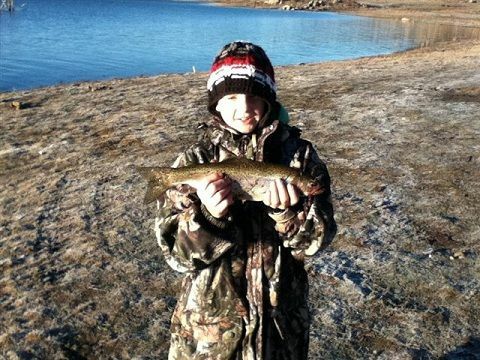 The good fishing has continued at Buckenderra over the past few days. Malcome caught 5 rainbows yesterday, all after 8.30am, all good size and their tummies full of yabbies. They were caught on Orange Pulp & Chunky Cheese Gulp Bait. 15 Rainbows were also caught spinning using Lofty No.26 and Tassie Devil No. 68. There were some smaller fish among them, but thay managed to get a good feed out of some nice sized fish as well. Bob & Racheal over the past few days have caught 6 good size rainbow trout on mudeye and 15 smaller ones on Orange Pulp & Sherbert Burst Gulp Bait. A good number of fish cruising the edges early and late at present so well worth a look. Best flys are B/H Nymph and wooly buggers. 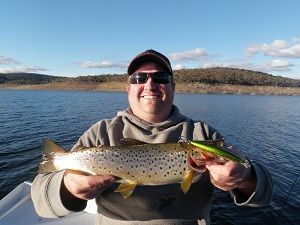 Jindabyne fly reports have improved with some handy fishing in the waste point area along with Sids Bay at East Jindabyne. Some very well conditioned chrome rainbows have been taken from these locations recently. Best flys are black wooly buggers, B/H Nymphs, and Yabby Patterns. The bait fishing in Eucumbene has been very good with Powerbait taking some good catches. Worms under a bubble float have come into their own now with the cooler weather Rainbows are loving Powerbait and Scrubbies in the Buckenderra arm and also Seven Gates with many anglers catching their bags. Lime twist, Fl.Orange, chunky chartreuse, Rainbow candy has been the popular favourite this week. 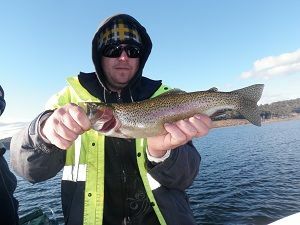 Bait fishing has been excellent with some good catches of mostly Rainbows in Jindabyne. Powerbait and Scrubworms have been the best baits. Areas to look at in Jindabyne are Kalkite, Hatchery Bay, Creel Bay, Sids Bay, Clay Pits, Stinky Bay and Hayshed Bay. Best powerbait. Pink nuggets, Fl Orange, Lime Twist, Rainbow Candy. 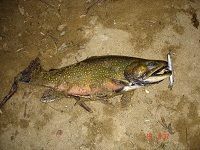 Jindabyne trolling reports have been pretty good in the Kalkite and waste point area along with the eastern side. Sids bay Scrub worm and powerbait fishing has been great over the weekend. Best colours in the powerbait have been have been the Rainbow and Sherbert nuggets along with Scrub worms have been doing very well over the last week as well. Tassie Devils 48, Y36, Y48, Y82, Y90, YFR, 26, PP, strike pro blades, Rainbow Squidgies. Eucumbene reports have been varied. Deep trolling and drifting and casting lures amongst the timber are good methods to use at the moment. Flat line trolling in very close in the shallower bays has produced some nice fish and the fish will move into shallow water early looking for food. Drifting and casting small minnows or plastics will turn up some good rainbows and the odd brown in the hour or so around sunrise. Leadcore line trolling has been working well with tassies, cobras and vibes this week. The deeper water off Cobrabald and Yens bays, Buckenderra, Anglers Reach has produced some nice rainbows.